Once New Line killed Freddy, it pretty much put the nail in the coffin of all the horror characters of that particular generation. The great 80s horror boom party was over, though some filmmakers and studios were still trying to generate life in an otherwords dying genre. One such film was Popcorn, written by Alan Ormsby (Deathdream, Children Shouldn’t Play With Dead Things), the film tried to introduce a new horror villain into the genre’s canon. Would it succeed or would this Popcorn simply be as stale as all the other slasher-wannabes? A group of fun-loving film students decide to put on an all-night horror marathon as a last hurrah for a local theater that is about to be torn down. Looking through a batch of classic horror movie props brought over by the owner of a local antique store, the students find a small canister of film. When they screen the film in the projector, it’s a bizarre series of random shots…extreme close-up of an eyeball, extreme close-up of a mouth and nose…a severed head on a dinner table…with the word “possessor” repeated. Just before the footage ends, we see a bearded man with a curvy sword about to sacrifice someone on an altar…but then Maggie (Jill Schoelen) faints. The cast then learns that "Possessor" was the solo film by Lanyard Gates, a crazed filmmaker who during the film's premiere, sacrificed his family and ended up being burned alive during an accident at the screening. Curious about the film's recent resurfacing, Maggie's mother wonders around the theater alone one night and disappears. With no knowledge that her mother is missing, Maggie and the rest begin the all-night horror marathon, but soon, some of the film students are killed one-by-one by a truly deranged killer. Has Lanyard Gates returned from the grave to exact revenge on those who laughed at his lost masterpiece? Popcorn is a lot of fun. I remember the first time I saw it, it had just come out on VHS and I took it over to a friend’s house. As big horror fans, we loved it at the time. Now, years later, I think the film has its faults, but it’s still quite enjoyable. I love movies about making movies and by the same rationale, I love movies about other people who love movies. Call it a bias, but I enjoy seeing other people who are as interested in movies as I am, especially of the horror genre. The characters in the film who want to restore the old theater before it gets torn down seem to genuinely love schlocky old horror movies and want to pass along their love to the packed audience that shows up for the film. It made me wish that a theater nearby would do the same thing so that I could attend and have as much fun. The three fake B-movies that are shown at the theater during the horror marathon (“Mosquito”, “The Incredible Electrified Man”, and “The Stench”) are pretty entertaining, yet surprisingly authentic, send-ups of sci-fi horror of the 50s and 60s. I really liked the cursed film/snuff/cult film storyline. The idea of a lost film is nothing new to horror fans, and one that is allegedly cursed like "Possessor" seems to be makes for a pretty cool concept. Not to mention that hippie cults are pretty scary, anyway. The killer is an interesting combination of Leatherface and Freddy. He covers his disfigured face with latex masks he’s made himself, while delivering maniacal laughter and quipping as only a movie villain could after the invention of Freddy Krueger. Tom Villard’s (this isn’t really that much of a spoiler, considering not a lot of time is spent setting up any sort of mystery angle) performance as the killer is a surprisingly potent one. Most will remember him from his supporting roles in My Girl (as one of the students in Veta’s poetry class) and as one of the Stork brothers in the Savage Steve Holland comedy classic, One Crazy Summer. With comedy being his strong suit, it was intriguing getting to see him portray such a dark, insane character. This is the type of role that Vincent Price made a living playing, and Villard handled it with seeming ease. A shame that only three years after his work on Popcorn, Villard succumbed to AIDS. Horror fans will always have this spectacular performance to enjoy. Had he lived a longer life, I think he could've had a decent career in the genre, playing similarly disturbing and quirky villains. The film seems, from everything I’ve read, to have had a somewhat troubled past. Allegedly, writer Ormsby was the original director on the film, but left the project shortly after production began and was replaced by Porky's actor Mark Herrier ("Billy"). It’s hard to tell what was shot by Ormsby and what was shot by Herrier, but the film is competently (if a little by-the-numbers) shot. Also, lead actress Amy O’Neill was replaced shortly after filming began by veteran late 80s scream queen, Jill Schoelen (Cutting Class, The Stepfather, and Robert Englund’s Phantom of the Opera). Schoelen is attractive enough for the lead but I’ve never found her personality to be all that engaging. I may take flack for saying this, but she’s strictly middle of the road when it comes to great scream queens. Of course, she's hot enough to melt the butter on any horror fan's popcorn, so performance and character issues can be overlooked. Writing under the name "Tod Hackett", Ormsby's script is fun (if a mixed bag when it comes to story), and full of its share of early 90s cheese. If you're a horror fan, no doubt you'll recognize the composer...Paul Zaza. The man responsible for some of the more better slasher and horror scores (My Bloody Valentine, Prom Night, Ghostkeeper) of the early 80s. Much of the pop music heard in the film is of the reggae variety (including a reggae/early 90s pop cover of the oldie "Saturday Night at the Movies"), which is really no surprise at all considering the film was shot in Jamaica. 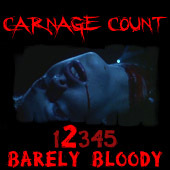 The film doesn’t have a very high body count. The death scenes aren’t very bloody, but they are relatively inventive. Each death mirrors an aspect of one of the films being shown in the horror marathon. For example, one character is impaled on the stinger of a giant prop mosquito that flies over the theater audience during the showing of “Mosquito”. The visual effects range from so-so to pretty good. The makeup on the villain is pretty good. The victim of a tragic disfigurement and attempted repair through skin grafts, he is truly grisly to look upon, making the scenes where his intensity is upped by yelling threats all the more menacing. I think one of the script’s biggest missed opportunities is that it ignores the theater setting and audience. The villain’s goal is too localized. His focus is on the film students and nothing more, leaving the setting not utilized to its full potential. A slasher in a movie theater is a novel idea, but doesn’t really go anywhere here. Demons had the right idea. You had audience members feeling the threat of what was going on, running around, screaming, there was a feeling of chaos and that something could happen to anyone at any given time. In Popcorn, you only feel that the main characters are threatened and that everyone else is just set decoration. Popcorn was released on DVD by Elite Entertainment. The video transfer is widescreen but could definitely use a new restoration. It’s quite dark for a DVD transfer and not very crisp and clean. The disc doesn’t have much in the way of bonus features. Trailers for the film and a few others, and that’s about it. It is now out of print, so perhaps the rights have gone to another company who is planning a future double-dip, hopefully with a much better transfer. Still, Popcorn is worth tracking down. Reggae, a Zaza score, a Vincent Price-ish villain with shades of Freddy Krueger, the film is a mish-mash of several different influences and makes for quite a unique film. It may not be the scariest or goriest movie that you could choose to watch during a festive October evening, but wearing it’s love of horror films of the past on its sleeve, I can’t help but recommend it. It's a lot like mixing a bag of M&Ms into your warm buttery popcorn. Sure, it doesn't completely fit, but somehow makes for a delicious taste uniquely its own. Rent it!